An instant bestseller when it was published in America, the sentimental novel Charlotte Temple speaks to the popularity of the genre-and the public thirst for fiction-from the early national period and beyond. This Norton Critical Edition is based on the first American edition of 1794; the author's original spellings have been maintained. It is accompanied by a detailed introduction, explanatory annotations, and A Note on the Text. An unusually rich "Contexts" section is thematically organized into four parts-"Women in Early America: Intellect, Education, Sexuality," "Reading in Early America," "The American Sentimental," and "Selections from Rowson's Writings"-and includes works from Rowson's time to our own. Ten illustrations from the eighteenth and nineteenth centuries are reproduced to further enrich the reading experience. "Criticism" collects thirteen insightful assessments of Charlotte Temple spanning four centuries and addressing its central issues. Contributors include Matthew Carey, Samuel L. Knapp, Larzer Ziff, Jane P. Tompkins, Gareth Evans, Julia A. Stern, and Marion Rust, among others. A Chronology of Susanna Rowson's life and works and a Selected Bibliography are also included. Marion L. Rust is Associate Professor of English at the University of Kentucky. 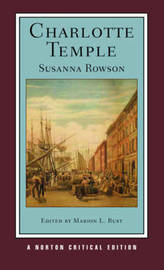 She is the author of Prodigal Daughters: Susanna Rowson's Early American Women. Her essays and reviews have appeared in the William & Mary Quarterly, Early American Literature, New England Quarterly, Journal of American History, Studies in Eighteenth-Century Culture, Feminist Interventions in Early American Studies, Novel: A Forum on Fiction, Modern Philology, and Passing and the Fictions of Identity.